To gain access to high places in industrial environments, such as factories, you will need a sturdy and reliable ladder to allow you to work safely while performing tasks at height. Our heavy and extra heavy duty folding platform steps are manufactured to British Standard BS2037-1994 Class 1, for industrial use, so you can be confident they are built for an industrial environment. 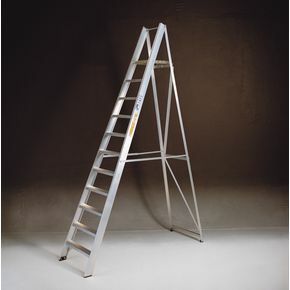 Their serrated aluminium treads give the user great underfoot grip allowing them to go up and down the ladder without fear; it also enables them to use the unit confidently, so they can perform their tasks to the best of their ability. Our products are foldable allowing them to be stored out of the way when they are not in use - they are available in a choice of eight platform heights; 640, 870, 1100, 1330, 1560, 1790, 2020 & 2250mm. They also come with a 12 month guarantee and FREE UK Delivery.